When is the last time you've read an honest, funny book about living with disabilities? To the Left of Inspiration: Adventures in Living with Disabilities is just such a book. You'll learn from a woman blind from birth about activities of daily life, like talking to children about disabilities, traveling, going to church, and working. Great memoirs about amazing people with disabilities exist, as do hundreds of books about the diagnosis and treatment of a particular disability. There are also books for specialists about teaching, rehabilitating, or accommodating a particular kind of disability. Since the passage of the Americans with Disabilities Act, more and more people interact daily with students, customers, and clients with disabilities and want to do so knowledgeably and sensitively. 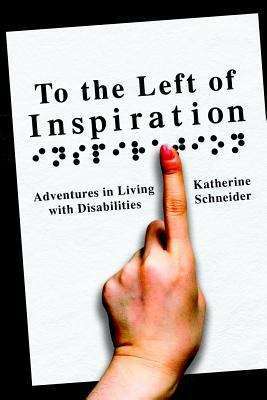 The life experiences Schneider describes to exemplify her suggestions to the reader highlight the warmth and humor in all of our struggles to be humane with each other, whether we are temporarily able-bodied or disabled. Fifty-four million Americans have chronic illnesses or disabilities requiring them to make accommodations in the ways they live their lives. They have families, friends, coworkers, teachers, health care professionals, and church leaders who want to know what their disabled friend is going through and how to help. Schneider writes about living with blindness for over fifty years and fibromyalgia for ten years.